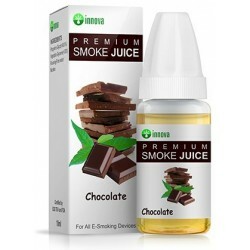 Chocolate Smoke Juice 10ml Innova VG+PG liquid. The Delicious Nuts series is created with the finest quality ingredients from nature; it is elaborately blended to deliver a smooth and elegant silky taste of the savory nuts, cocoa, or coffee. It comes in a variety of blends and strengths that will surely reward your senses with extreme delight and satisfaction.